In a bid to compete with GM's OnStar and Ford's SYNC, Toyota unveiled Entune at CES today. 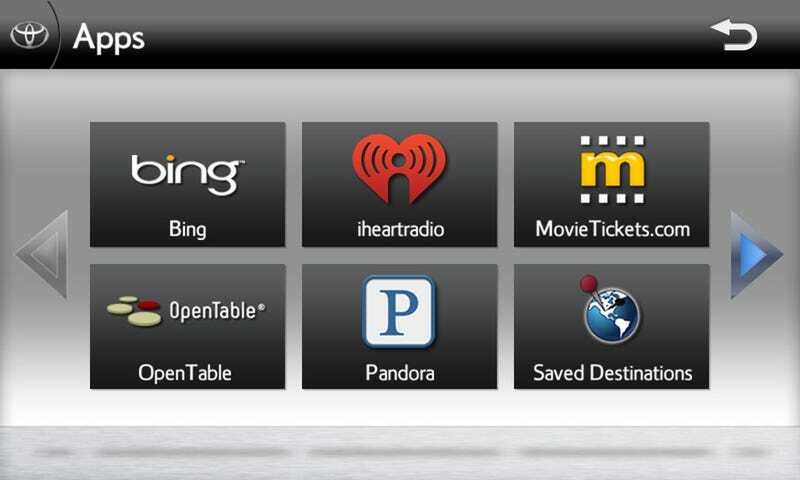 With Pandora, Bing-based Microsoft navigation, and OpenTable.com coming to their new cars, Toyota drivers will never look at the road again. Entune, like SYNC, is a "Bring Your Own Device" type system that uses the customer's cell phone with a data plan to capture information. What phones you can use with it and when is up-in-the-air; we just know it's for some cars with some phones at some time later next year. The most useful features at launch are Bing and Pandora. The addition of Bing Local search allows for a much larger range of local points of interest that are constantly updated, trumping typical automaker in-car navigation systems. Music fans who already enjoy Pandora on their phone or computer will appreciate being able to bring their Conway Twitty/Warpaint crossover station to their car. Like SYNC, it'll utilize voice recognition to offer an alternative to looking down at one's cell phone or staring at a screen instead of the road. Also like SYNC, the ability to do so easily or frequently will probably be overstated and people will just screw with the screen before crashing into things, but now they can at least blame it on unintended acceleration.